GO PIZZA CRAZY AT ARIA! 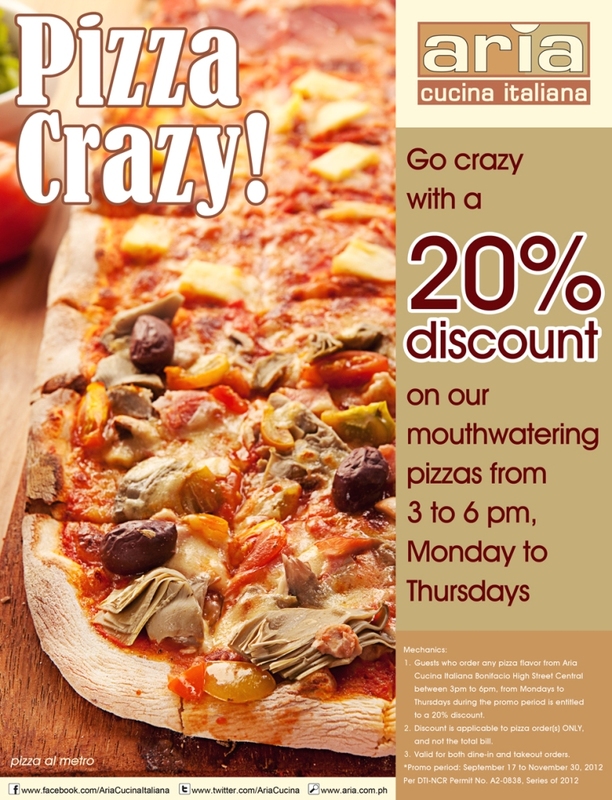 The pizza crazy promo at Aria Cucina Italiana has now been extended til November 30! Enjoy 20% off on ALL Aria's mouthwatering pizzas from 3PM-6PM, Monday-Thursday! See you all at Aria Cucina Italiana (Unit NEUG 205, East Superblock, 30th St. corner 7th St., Bonifacio High Street Central, 1630, Manila, Philippines). Make sure to like Aria Cucina Italiana on Facebook here and follow them on Twitter here. The soul and symbol of Christmas in the metropolis shines on November 9 when Araneta Center lights its iconic giant Christmas tree in meaningful and festive rites. For 31 years since it was first installed, the Araneta Center’s giant Christmas tree signaled the official start of the holiday season in these environs. The tradition borne out of a wish by J. Amado Araneta to erect the country’s biggest Yuletide tree continues to extend Christmas cheer to as many Filipinos as possible. This year, Araneta Center once again teams up with Coca-Cola in a tree lighting ceremony that continues the legacy of spreading holiday cheer through simple acts of happiness to Filipinos. Hosted by Megan Young and Robi Domingo, the Yule activities will involve a constellation of television and movie celebrities from different networks, Coca-Cola’s Happiness Ambassadors and Binibining Pilipinas beauty queens. Among the stars that are expected to grace the festivities on November 9 are Enrique Gil, Jessy Mendiola, PBB Myrtle Sarossa and Yves Flores, Alden Richards, Louise Delos Reyes, Thea Tolentino, Jeric Gonzales and X-Factor Grand Winner KZ Tandingan. In line with the theme of promoting positivity via sharing simple acts of kindness and happiness, Coca-Cola, in partnership with the Araneta Center, remind the Filipinos that there are still more reasons to believe in happiness through the different activities this season. Araneta Center’s Christmas Tree Lighting is just one of the many Yuletide activities lined up for the season. The Big Dome will once again be agog with concerts and special presentations that hype the holiday spirit. A British musical invasion of sorts comes to the Big Dome with back-to-back performances of musical icons Elton John (Dec.8) and Sting (Dec. 9). 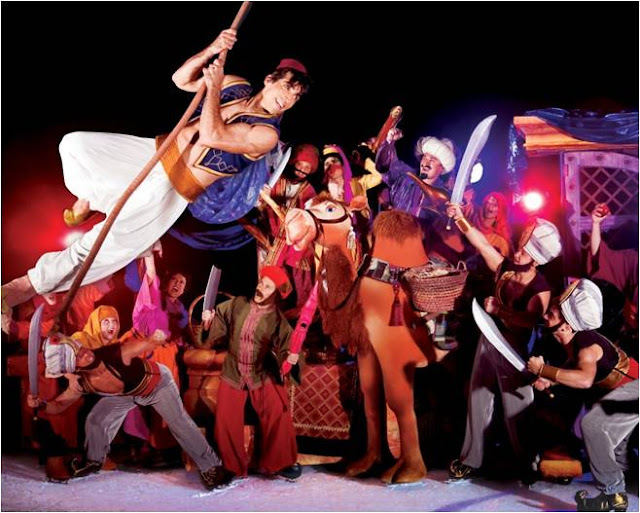 From Christmas Day until January 3 of the New Year, Disney on Ice presents Princesses and Heroes in yet another memorable ice spectacle. The tree lighting likewise ushers in more holiday fanfare including the season’s bargains offered by the three malls – Gateway, Ali Mall and the New Farmers Plaza, restaurants and Farmers Market. 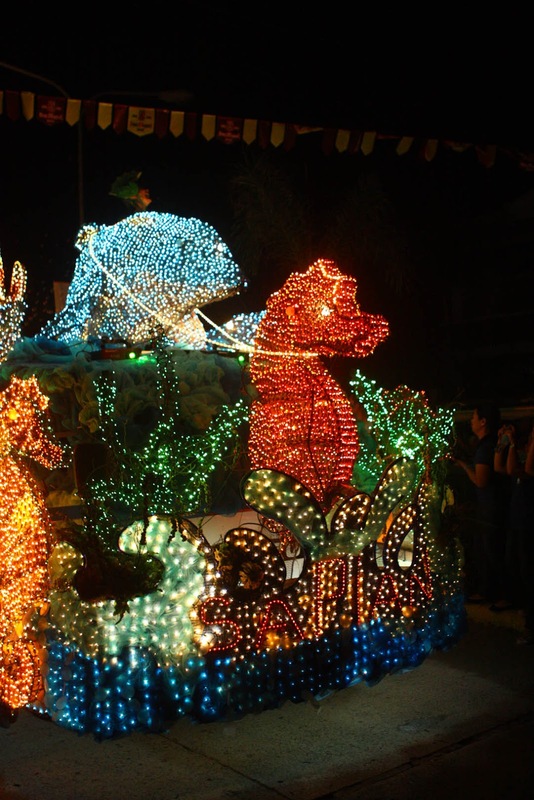 The Parolan display also lights up on November 16 near the Farmers Garden. Fireworks will light up the Christmas sky every Friday and Saturday from November 30 to January 3. There will also be chorale competitions, food booths and a magnificent showcase of gaily-lit floats depicting creatures from the sea at the Giant Christmas Tree parking lot. With its gamut of Christmas activities including the much-anticipated Disney on Ice show, Araneta Center is a virtual paradise that nurtures the Christmas spirit and continues to touch the hearts of generations of Filipinos. The activities of Araneta Center’s Giant Christmas Tree Lighting will start at 3pm at Quadrant C outside the Red Gate of the Smart Araneta Coliseum. Yes, it’s beginning to look a lot like Christmas at the Araneta Center! "Some things are better left written." Ever more charming when a personal touch is felt. Especially so, today in a digitally and technologically driven world wherein things are done within seconds and through a couple of clicks. We have failed, forgotten to pause, take a moment and really, sincerely express what we want to say. Don't miss the nationwide luxury sale of SM Accessories Privado! 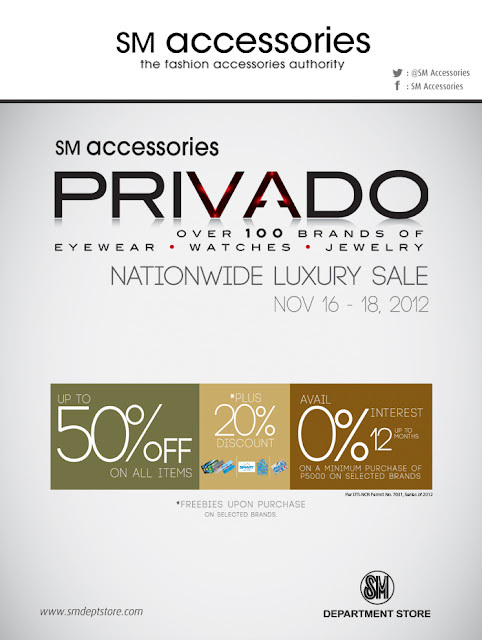 There are over 100 brands of eyewear, watches and jewelries that will offer up to 50% off (plus another 20% off for the members of SMART Rewards and those who have an SM Advantage Card, BDO Rewards Card, SM Prestige) on November 16-18. See you there!! Say hello to the most adorable Christmas yet! Hello Kitty, the world’s most beloved feline, is finally coming to see her friends up north… SM City North EDSA, that is. And she brought loads of surprises! Visit the Hello Kitty Village at The Block Atrium from November 10 to January 6! Dig in to sumptuous sweets at Hello Kitty Cake Shop. Pass by the Hello Kitty Coffee Shop and chill out with world’s cutest Kitty. Hang out and take photos at Hello Kitty House. Have fun at the Activity Hall for exciting activities. Or light up the sky with wonderful Hello Kitty lanterns at the Skygarden! 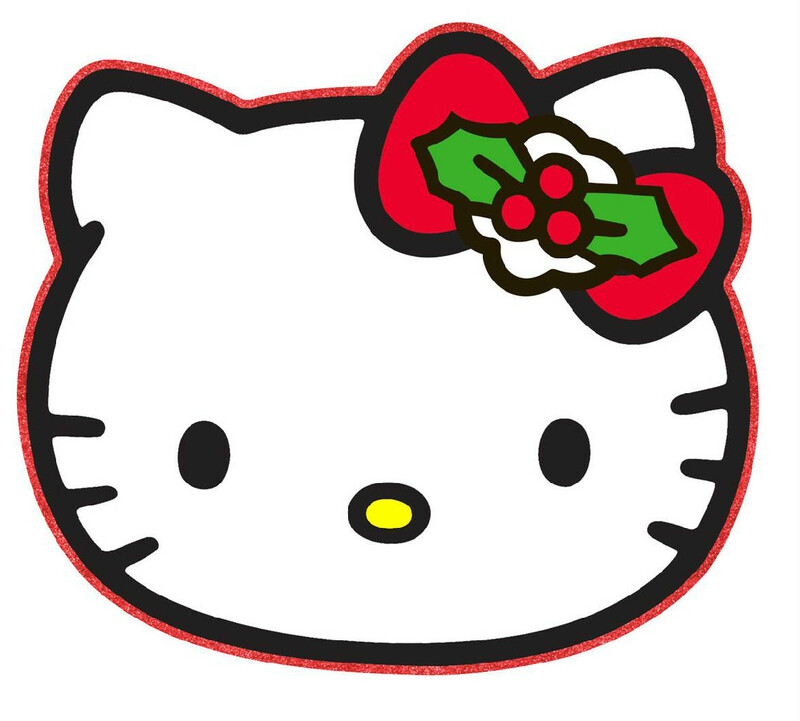 From November 10 to December 24, 2 to 4pm, see Hello Kitty up close and have your own Hello Kitty face paint at Hello Kitty Village at the Block Atrium. December 8, 4pm, at The Block Atrium is Hello Kitty’s own fashion show by SM Department Store where you can see the latest on Hello Kitty items. If those are not enough to sooth your Kitty craze, drop by The Block, third floor, from November 10 to January 6, to see the Hello Kitty Luxe Collection where cool stuff about your favorite cat is on display. These sophisticated collections mix the essence of Hello Kitty with a touch of style and fun. Oh, we hope that you were nice throughout the year for the Santa Meet and Greet at the City Center third floor, on December 9, 16, 24, and 25, from 3pm to 5pm. Now if you’re wondering how it is like to drive Kitty-style, then check out the Hello Kitty car display collection. Those wanting a Hello Kitty dream house should stop by the Interior Zone where our avid collectors and Interior Zone tenants have teamed up with The Philippine School of Interior Design for some awesome vignette exhibits from November 10 to January 6. We’ll also give you ideas on how to throw your most memorable themed parties for this Christmas with the Holiday Party Workshop on November 24 and December 1 at 4pm. New to the Sanrio family, the Mr. Men and Little Miss characters will accompany Hello Kitty in her stay at SM City North EDSA. Join them in their interactive world of Misterland on December 1 and their storytelling sessions on December 2, 14, 22, 23 at the Annex Fourth Floor for free. Listen to some Christmas hymns sang by our grand chorale on December 2 and 16. See this season’s All-4-kids Sale at the City Center third floor from November 14 to 18 and December 10 to 16. Buy the best gifts at the biggest SM Kid’s Holiday Bazaar at the Skydome on November 30, December 1 & 2..
Head up to the Skygarden for the brightest and most colorful fireworks display on Novermber 10 and December 2, and 16, starting at 7pm. Witness the spectacular giant Christmas Tree by Firefly at the waterfalls area. Shop all you want! Enjoy a happy feast! There’s no Christmas celebration like this! Come one! Come all! There’s so much to see and do! Feeling somber, stressed, and plagued with life problems? Then come to the event that gives the best medicine – laughter! 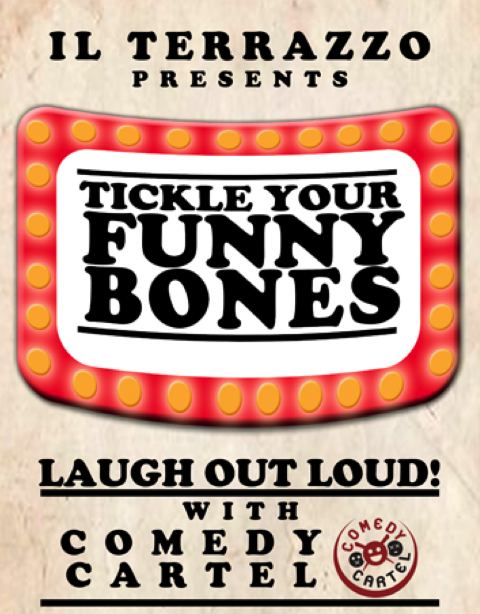 Il Terrazzo presents Tickle Your Funny Bones! Without a doubt, this will be a night of giggling, laughter, and overjoyed spirits. This might just be the break and unwinding you need! 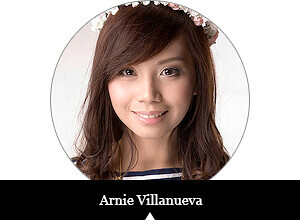 Tickle Your Funny Bones will be featuring Comedy Cartel, one of the premier comedy guilds in the Philippines. They specialize in the art of stand-up comedy and have sent the Master, Alex Calleja and company to entertain you throughout the night! Tickle Your Funny Bones will deliver their pee-inducing comedy spiels on November 10, 2012, Saturday, 7PM, at the Il Terrazzo lobby (fountain area). The best things about this is that the show is open to the public; so feel free to invite your family, friends, everyone! Christmas in the air! And when it’s a time of gift giving, it’s also the time for gift buying! 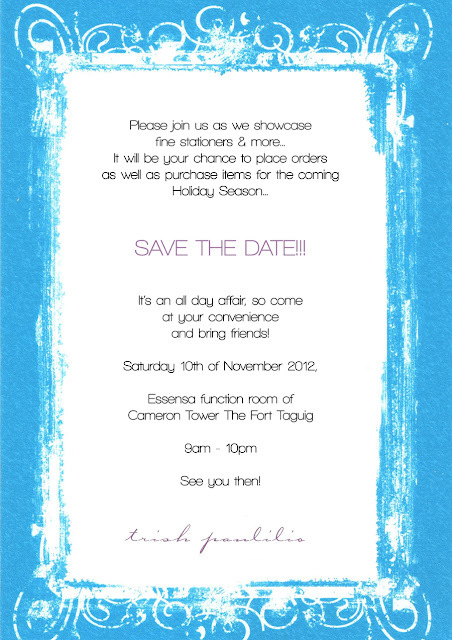 So why not opt for an alternative boutique shopping experience that’s better from crowded and busy malls. Il Terrazzo presents LUXE: A Pre Christmas Sale happening on November 10-11 from 11:00 AM to 7:00 PM at the Penthouse Level! Start your Christmas shopping early with great finds from our retailers while enjoying the chill sounds of a live DJ, snacks and cocktails! Entrance is free and we’ll also be giving away great raffle prizes to boot! 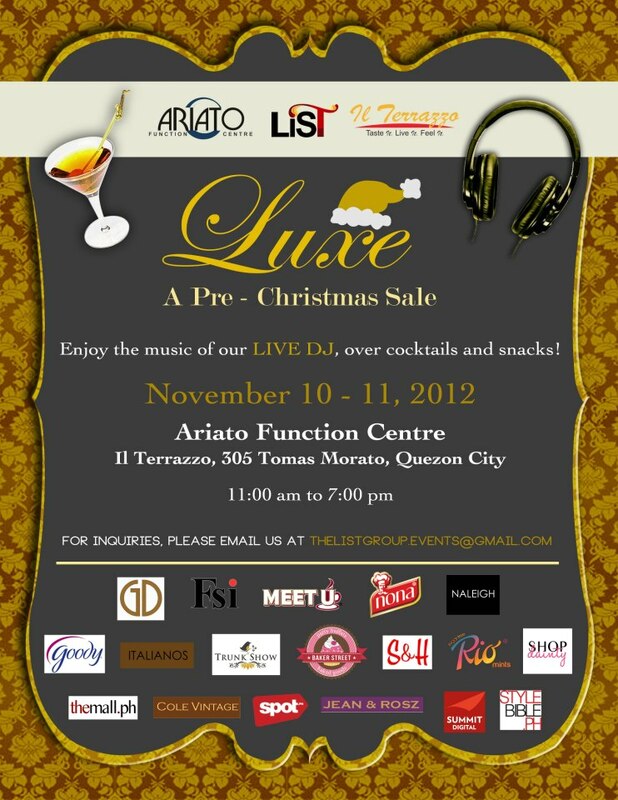 So see you this weekend at LUXE!